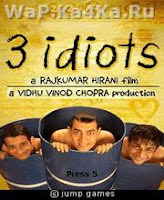 3 Idiots : A Bollywood movie based game is now available for download for Java Mobile In 240x320, 128x128, 128x160, 176x208, 176x220 Size. Its a jump type full comedy game. Play and have a new fun. have a humorous puzzle online. Select any appropriate options and laugh extremely unlimited :).